Using paper trimmer, cut patterned paper into 1-1/2″ strips. Fold strips in half lengthwise, creating 3/4″ strips with one folded edge. 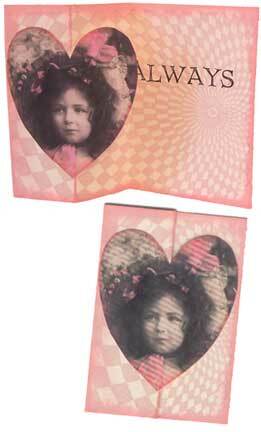 Assemble strips into bundles of A, B and C papers, one bundle for each design. Set strips aside for the moment. Print pattern below. The easiest way to do this is to save it to your local drive, and then print it from any graphics software. 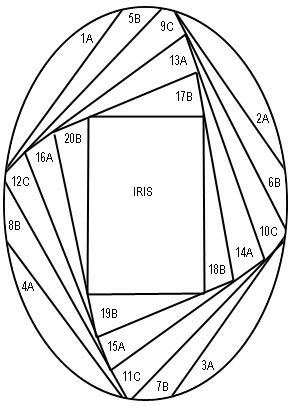 The pattern is for a roughly 5 x 4 inch oval, but you can resize it to any measurement you wish. Lay out your folded papers in piles of A, B and C. It’s very important that you keep your letters straight! Start working your pattern with section 1A. Place the folded edge of the paper A against the 1A line closest to the center of the aperture, covering section 1A completely. Tape in in place, and trim excess length away. Do the same thing with section 2A, 3A and 4A. Now pick up paper B, and tape pieces over 5B, 6B, and so on. Keep following the pattern, working your way around the oval, one paper at a time. When all sections have been covered with papers, your design is almost complete. Gently remove your cardstock from the work table and turn it over to reveal your iris, with a rectangular opening in the center. This will act as a frame for your photo. Slide the photo into position behind the iris and tape in place.